Leaders supporting churches in regional areas. Thriving congregations wanting to grow & advance with new ministries. Congregations needing to grow, create new energy, & reengage with Christ. Individual Christians seeking to grow in their experience of God. We have worked with hundreds of congregations leading them to discern ways to move to a growing fruitfulness. Through the Acts 16:5 Initiative, we have seen small and large congregations, thriving congregations as well as those struggling to hold on, show honor to the people and past and present ministries while moving into a new future. Life in ministry is as blessed and rewarding as it is tough and disappointing. We want to be on your team as you live and work out God's call in your congregation's life. For more information about the Acts 16:5 Initiative for your congregation and/or for your denominational region, contact VCI at: stan@vitalchurches.com or at 703.598.9536. We find ourselves in a day where congregations of all sizes are doing well, hanging on or losing ground. We live in the midst of a culture that is changing so rapidly a number of words apply such as "manic," "high velocity," and "turbulent." Our challenge is to bless the people and programs of a congregation's past and present while discerning God's new future in our rapidly changing world. 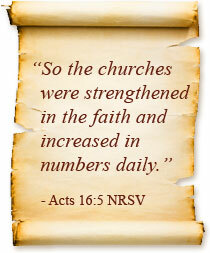 Growing a vital church is always the work of God in our midst. It is a challenging task for we who are the people of God. However, we know what the alternative is – a church without vision or vitality with little missional engagement with its world. Our passion is to grow congregations that connect you with God, challenge your interior life, support you when you are in turmoil and equip and motivate your practice of the Christian faith. God has a transformational future for your congregation and ministry – and for each of us personally. The Acts 16:5 Initiative is designed to stimulate conversation, imagination, and new directions in the vitality of the shared Christian experience. Please consider us to be a part of your team! Understand the truth of the words spoken by W. Edward Deming, renowned management consultant: “Every system is perfectly designed to achieve the results it gets.” If you are fully satisfied with the life of your congregation as it is, there is no need to think about a transformational future. However, to grow in the vitality of our worship, fellowship, and discipleship, as well as in our missional impact on the surrounding community, we need to ask – how do we transition from the work of our present ministries and members while creating the new to reach the present and next generations? How may we lead a transition such that our past ministries and present participants are valued and honored as we move into God's new future? Invites congregations in denominational regions to engage in a deliberate process of transformation. Assists denominational regions and congregations in developing a coherent biblically-grounded approach to transformational vitality and missional impact. Assists congregations in the design of specific transformational and missional ministries. Rather than offering a set “program,” this initiative supports the design of ministry appropriate to a given situation. Enables denominational regional staff the ability to offer direct coaching, leadership development and resourcing of pastors and congregational leaders seeking to move their congregations forward. Offers a means of validating congregational change. Offers an opportunity to apply the principles of transformation and missional engagement to the life of the denominational region itself. The Acts 16:5 Initiative is not a simple checklist. Rather, it offers a comprehensive theology of transformational ministry, essential Defining Practices, and a wide variety of potential “next steps.” Since every congregation faces different issues and possibilities, this initiative involves great freedom for each pastor, leader, and team in discerning the next “best” steps.